The use of predictive simulations in combination with experiments for the discovery and rational design of functional materials with emerging phenomena is a central objective of computational condensed matter physics and computational materials science. 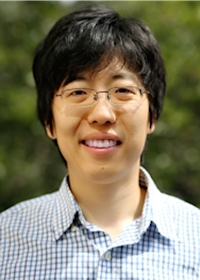 My research interest is to develop first-principles computational algorithms and data-driven technologies to identify and exploit structure–property relationships in functional materials and accelerate the discovery, understanding, and development of advanced materials, such as semiconductors for solar energy conversion, low-dimensional functional materials, and efficient fuel production catalysts. My current research includes: (1) the creation of a 2D materials database and the data-driven discovery and rational design of two-dimensional electronic and topological materials; (2) the development of data-mining and machine learning techniques to analyze multiple sources of materials information with different dimensions to predict hard-to-determine physical properties; (3) defect formation and carrier recombinations in functional energy materials including solar energy conversion, optoelectronic devices, and thermoelectric materials. Q. Yan, J. Yu, S. K. Suram, L. Zhou, A. Shinde, P. F. Newhouse, W. Chen, G. Li, K. A. Persson, J. M. Gregoire, and J. B. Neaton, "Discovery of solar fuels photoanode materials by integrating high-throughput theory and experiment", submitted. L. Zhou, Q. Yan, A. Shinde, D. Guevarra, P. F. Newhouse, N. Becerra‐Stasiewicz, S. M. Chatman, J. A Haber, J. B. Neaton, and J. M. Gregoire, "High Throughput Discovery of Solar Fuels Photoanodes in the CuO–V2O5 System", Adv. Energy Mater. 5, 1500968 (2015). Q. Yan, G. Li, P. F. Newhouse, J. Yu, K. Persson, J. M. Gregoire, and J. B. Neaton, "Mn2V2O7: An Earth Abundant Light Absorber for Solar Water Splitting", Adv. Energy Mater. 5, 1401840 (2015). K. Liu, Q. Yan, M. Chen, W. Fan, Y. Sun, J. Suh, D. Fu, S. Lee, J. Zhou, S. Tongay, J. Ji, J. B. Neaton, and J. Wu, "Elastic Properties of Chemical-Vapor-Deposited Monolayer MoS2, WS2, and their Bilayer Heterostructures", Nano Letters, 14 (9), pp 5097–5103 (2014). Q. Yan, P. Rinke, A. Janotti, M. Scheffler, and C. G. Van de Walle, "Effects of strain on the band structure of wurtzite group-III nitrides", Phys. Rev. B 90, 125118 (2014). M. S. Miao, Q. Yan, C. G. Van de Walle, W. K. Lou, L. L. Li, and K. Chang, "Polarization-driven topological insulator transition in a GaN/InN/GaN quantum well", Phys. Rev. Lett. 109, 186803 (2012). Q. Yan, B. Huang, J. Yu, F. Zheng, J. Zang, J. Wu, B. L. Gu, F. Liu, and W. H. Duan, "Intrinsic current-voltage characteristics of graphene nanoribbon transistors and effect of edge doping", Nano Lett., 7 (6), pp 1469–1473 (2007).